NOVA Family Auto Service, Your Service And Repair Experts! Hello, and thank you for taking the time to stop by our website! 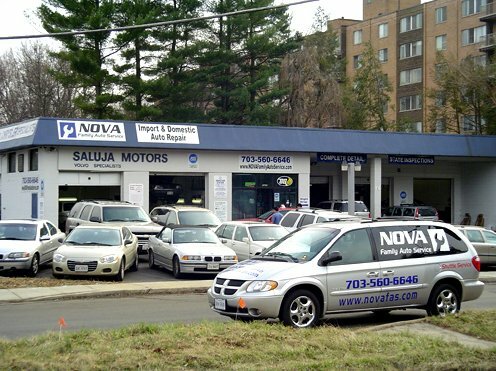 Here, at Nova Family Auto Service, our goal is to completely satisfy our customers. We have updated our facility with the latest computer and diagnostic equipment. We employ ASE Master certified technicians to provide dealer quality services at a fraction of the cost to you. You can trust us to fix your car right, the first time! Great service, I've brought my cars here a few times and am very happy. They are very honest and don't try to find extra problems with my cars to try and get more money from me. Service was quick and the price was very reasonable. Definitely recommend! Superb. My car had been overseas for a decade. I knew it needed quite a bit of work. I had planned to take it to the dealer to make sure the work was done right, but I decided to try Nova based on all the good reviews. I was not disappointed. They are very accommodating in terms of scheduling; they were thorough; and they communicate very well. I took advantage of the first time customer discount and the ride service - they provided both without a hitch. I will definitely return to them for all of my future car repair needs and I will recommend Nova to friends and colleagues without reservation. We started coming to NOVA years ago when it was Saluja Motors, Volvo specialists. During that time, we have had two Volvos and an Acura serviced here. You can expect honesty, quick service, and a ride to the Metro if you need one. I often wait while they do minor service, so it's convenient to walk over to the nearby strip mall for groceries, lunch or the local convenience store for a day-old cup of coffee if you're into that sort of thing. Carl is a straight shooter; don't worry about being taken advantage of. Most importantly, NOVA is much cheaper than having non-warranty service performed on your vehicle, whatever the make.